Some exciting developments for the Exodus to Jazz Series! 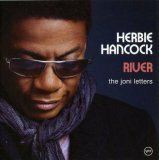 So, were you as surprised as Herbie Hancock was on last night's 2007 Grammy Awards show when it was announced that his album of Joni Mitchell music River: The Joni Letters had won the Best Album award? Damn! A jazz album getting a Grammy for Best Album? As the stunned Hancock pointed out, this was the first time that it had happened in over 40 years. While I dutifully report the Grammy nominations, I've often disagreed with and sometimes outright guffawed at their choices for Best Album and other categories. Who woulda thunk that they'd actually pick a jazz album and a pretty damn good one to boot! While River: The Joni Letters was seen by some as just another in a number of lesser works that have been appearing on the jazz scene trying to cadge some sales out of tributes to this or that artist's music, with the obligatory appearance by Norah Jones, it is unlike those albums in a number of ways that distinguish it and, I think, make it a great jazz album, despite receiving a Grammy. First, Joni Mitchell's music and lyrics have always struck me as full of jazz sensibilities. Listening to her music and her forays into jazz, such as 1979's Mingus (where, by the way, she was joined by Hancock and Shorter, as well as Jaco Pastorius), I've always thought that Joni Mitchell could have been (or is?) a great jazz vocalist and composer. Second, Hancock has assembled a killer group of musicians, including Shorter and Dave Holland, and they all bring something to the recording—they're not just going through the motions to get paid. His choice of vocalists also adds another layer of flavors to Shorter and Holland's (I especially loved Tina Turner on "Edith and the Kingpin" and Leonard Cohen was perfect for "The Jungle Line". My second (or was it third) time through River: The Joni Letters confirmed that I just enjoy listening to it. Leave a comment and tell us what you think. If you'd like to buy the albums on Amazon click on the links (or on the picture for River). Apparently, there is a special Amazon only version of River: The Joni Letters that has two bonus tracks, including "All I Want" by Sonya Kitchell, whom some of you may have heard at the 2006 Rochester International Jazz Festival.